During the course of the 12th century a series of standard glosses (interpretations) were compiled for each book of the Bible, and these became standard texts in monastic libraries all across Europe. This volume contains the Old Testament books of Leviticus, Numbers, and Deuteronomy, each with their gloss. This copy was apparently given to the cathedral priory of Rochester by Ralph de Ros, who was prior in the late 12th and early 13th centuries. 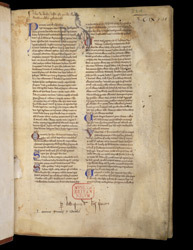 The larger inscription in the lower margin is the record that this manuscript was acquired through prior Ralph de Ros; the one in the top left margin records that it was kept in the cloister at Rochester cathedral, and this is followed by an anathema.